As a Durham fan, can't help but feel a bit sad by that. I know it's not the traditional emotion, but Durham has no hope of anything anyway, and it'd be good practice for 2018's promotion charge to expose Jennings, Steel, Clark to the best bowlers in div. 2 as much as possible. Oh captain my captain! Is Archer injured then? ...I tell a dirty lie about Middlesex, they've got Harris at seven. Well. Most amusing selection news remains Alastair being told that too many Cooks spoils the team. No Franklin for Middlesex. Probably the right decision, does leave a four-man bowling attack though. Hope Rayner's got his bowling boots on. Meanwhile Durham looks a bat light. Also in fantasy cricket punt news: this flat deck at the Oval smacks of James Hildreth's annual stats boosting triple century. Jofra Archer being left out?!?!?! ...when does a team ever win the toss and elect to field in the CC? Don't think you were, I tried to grab you via the forum. He just displayed an interest in the fantasy cricket and I said you were in charge. Sigh. Him and Wood. English pacers amirite? I'm surprised Pat ***mins isn't English. @StaggerBreaths Er I had no idea Lord Hopps and I were meant to talk, perhaps I was not on that day? Or did you get around to talking to him? Nemo, did Hoppsy get around to talking to you about Fantasy Cricket? Morning chaps! Big week of games all-round. Thanks for reminding me Joe... I'd forgotten i had a semi-final to contest! So is it Surrey's turn to complain about players being in an England squad and warming a bench, when the county could do with them...? Yessss, time for more long-form cricket. Can't beat it. This game was switched to Queen’s Park to allow Derbyshire to host a Boyzone concert at the 3aaa County Ground at the weekend. Gary Wilson takes over the captaincy from Billy Godleman, who had his hand broken by an accidental beamer at Hove, and Imran Tahir returns after playing for the World XI in Pakistan. Kent’s promotion hopes were ended by a draw against Gloucestershire in Bristol, and they have responded by resting senior seamers Adam Milne, Matt Coles and Mitch Claydon – which could mean a debut for Grant Stewart, a fast-bowling all-rounder from Sandwich Town CC. Paul Collingwood returns to lead Durham after a memorable experience with the World XI in Lahore, but Mark Wood is missing after suffering further heel problems in the draw against Kent two weeks ago – although he hopes to return in the last game of the season at Worcestershire next week. Chris Jordan returns for Sussex on the ground where he played for England in Saturday night’s T20 international, but any lingering promotion hopes were ended by a home defeat by Derbyshire without him last week – and they have travelled north without a quartet of senior players including Ben Brown, who has a bad back. Luke Wells takes over as captain, and Michael Burgess as wicketkeeper. Benny Howell will make his first Championship appearance for more than a year for Gloucestershire as a batting all-rounder. Cameron Bancroft has returned to Australia after carrying his bat for a double century in last week’s draw against Kent, and Gareth Roderick is out with a broken finger. Gloucestershire are aiming to complete a double after a rapid victory during the Cheltenham Festival in July, when 25 wickets fell on the first day. Notts lost top spot to Worcestershire last week, but have the chance to regain the initiative in the battle for the title – and in the process secure promotion both for themselves and Worcestershire. A draw would be enough for Notts to go up. Northants need at least a draw to keep their hopes high. Notts have lost Alex Hales and Jake Ball to England’s one-day squad, while Brendan Taylor has returned to Zimbabwe, so they will be forced to make at least three changes to the team beaten by Worcestershire at Trent Bridge two weeks ago. A first Championship since 1992 is already sealed, but Essex still have an unbeaten records to protect. They have named an unchanged 13-man squad, with Alastair Cook a notable absentee – he had been made available to play by England having played a significant part in Essex’s successful campaign, but that availability would have raised the tricky question of who to omit. Hampshire are fourth, still far from clear of relegation danger. 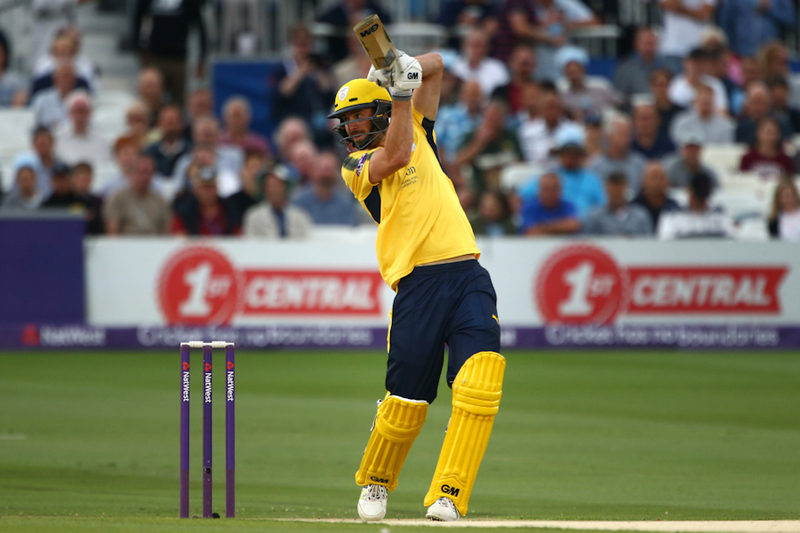 They welcome back a trio of senior players – George Bailey from the World XI in Pakistan, Liam Dawson from England’s T20 squad, and James Vince after injury. The 2016 champions find themselves in the relegation zone with two matches remaining. They will be pleased to return to Lord’s after encountering late-season outground difficulties at Uxbridge last week, and their options are considerably strengthened by the return of Dawid Malan from England’s T20 squad, Tim Murtagh and Paul Stirling from Ireland duty – and with Toby Roland-Jones also included after missing last week’s game with a side injury. Somerset have clambered out of the relegation zone with consecutive wins against Warwickshire and Lancashire, and not surprisingly they name an unchanged squad – with Jamie Overton and Lewis Gregory already ruled out for the season. Surrey, who are third in the table but not mathematically safe from relegation, add Amar Virdi and Jade Dernbach to the 11 who drew with Yorkshire last week. This will be a farewell appearance at the Kia Oval for Kumar Sangakkara, who has seven centuries from 12 Championship innings this season. This game was due to feature a clash between two Ryan Sidebottoms – only for a thigh injury to scupper the more familiar version’s Headingley farewell. West Indies opener Kraigg Brathwaite will make his Yorkshire debut at the ground where he excelled in the recent Investec Test, taking over from Shaun Marsh as overseas player for the last two games of the season – and finding himself in a relegation battle. Adam Lyth is also set to return after missing last week’s draw at Surrey for happy reasons – he’d become a dad. Warwickshire are playing for pride after their relegation was confirmed by last week’s defeat by Essex, their eighth of the season. They have lost Chris Woakes to England’s one-day squad.